It’s great to hear that you’re brushing twice a day, avoiding sugary snacks between meals, and making your regular Yuba City dentist visits. But when it comes to your health, flossing your teeth is actually more important than brushing. Most people think the primary purpose of flossing is to remove food from in-between your teeth, but that’s not the complete story! When you floss, you are most importantly removing plaque – that sticky, bacterial biofilm that clings to the surfaces of your teeth. Plaque is the primary culprit behind tooth decay, periodontitis (a severe form of gum disease), and even bad breath. Whereas brushing is a great start, flossing gets rid of the plaque where your brush can’t reach, like in the gaps between the teeth and gums. 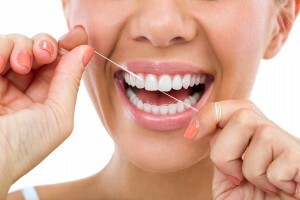 Additionally, flossing polishes the surfaces of your teeth and decreases the risk of gum disease. Many feel that they simply don’t have the time to floss. But in reality, when done right, flossing only takes a few minutes a day. Once you commit and get into a routine, you’ll find that flossing is easy to keep up with, and even helps your mouth to feel cleaner. More importantly, it will greatly improve your oral health. If you’re going to floss once a day, the best time is just before going to sleep for the night. Because saliva production slows down when sleeping, plaque in the mouth becomes more concentrated, and potentially more dangerous. “So how do I start,” you ask. Let’s walk you through the process. Make sure you have enough floss: Break off a piece about 18 inches long. This might sound like a lot, but it allows you to use a clean segment of floss as you move from tooth to tooth. Wind it around each middle finger, leaving a couple of inches to work with. Tip: Relax your lips and cheeks to make it easier to get your fingers into your mouth. Gently slide the floss between your teeth. Be careful that the floss doesn’t snap or “pop.” Form a “C” shape with the floss as you wrap it around your tooth, then run the floss up and down the tooth’s surface. Make sure to go down to the gum line and up to the highest contact point between the teeth. Tip: There are two sides to each space between your teeth. Floss each side separately so as not to injure the triangle section of gum that rests in between. Continue moving from one tooth to the next. As you do so, use a clean section of floss. Work all around the mouth, and don’t forget the backsides of the last molars, which often get neglected. Some studies indicate that flossing before you brush is actually more effective than waiting until afterwards. The thinking is that if you remove food and plaque first, the fluoride in your toothpaste more readily contacts the enamel between your teeth, making them stronger. What type of floss should you use? There are a variety of options to choose from, including waxed and unwaxed, flavored, shred-resistant, tape and string. Some find that waxed floss slides more easily into tighter gaps, but others feel that unwaxed floss gets the area between the teeth cleaner. Perhaps the most effective of all floss types is woven floss. It’s a rare commodity in the floss world, but many people who try it never go back to ordinary flosses. Feel free to use a variety of types, until you find what works best for you. You can also add water flossers or interdental brushes to your regimen. Together with string floss, these dental “tools” help you cover all the bases. 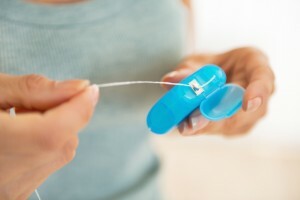 The goal is to find floss you are comfortable with, so that you are motivated to keep up with a daily routine! If you do, you are taking one of the best steps possible towards maintaining a clean and healthy mouth.